Have you ever felt hurt or betrayed by anyone, anywhere or anytime in your past?No matter what age you are, we’re guessing that you said “yes” to the above question.We’ve certainly had them. You may not consciously think about them but they are there, coloring your values, beliefs, thoughts, actions and interactions with others–unless you’ve done some deep healing. As you may have already experienced, these past hurts can certainly affect new relationships in harmful ways. Some of the reasons we come together in any relationship are to help each other to heal, to learn and to grow– and this includes healing past hurts. The opportunity for healing in a relationship can come in the form of showing us an exaggerated version of the scenario from the past that we’re holding on to, a mirror for us, or showing us an alternative way of being. What we’re saying is that if you’ve buried past hurts, they will come up–but that doesn’t mean that they have to ruin your current relationship. While our tendency as humans is to create similar situations over and over until we learn from them, heal and grow, we can start to make healthy choices that can help us enjoy ourselves a whole lot more in our relationships. When the two of us first got together, at times Otto felt like there were uncanny resemblances between Susie and his ex wife. These weren’t physical similarities but were rather ways that both of them would react to him in certain instances. At those times, he had to do “a lot of work on himself” (as we’re so fond of saying) to remember that this was a different relationship and that Susie was his beloved and wasn’t his ex wife. So what kind of “work” did he have to do on himself? 1. Recognize when you are triggered and carried into the past. Ask yourself if your anger, withdrawal or whatever you happen to do when you are triggered is either magnified by something that happened in your past or maybe even totally from your past. In other words, can you identify whether you were triggered entirely by what’s happening in the present or is your reaction mostly from what happened in your past? 2. Identify your thoughts and fears and question them. You may have heard the saying that fear is False Evidence Appearing Real. We suggest that you write your thoughts and fears on paper and then question their truth in your current life. 3. If you aren’t sure whether your reactions or fears are about the past or the present, ask your partner for a clarification about whatever triggered you before you react. Ask with curiosity, not blame. 4. Practice discernment. Create ways to differentiate one partner from another when you are triggered–whether your current partner is actually “doing” anything or treating you as someone in your past treated you–or not. Ask yourself–“How is this person or this experience different from my current partner or situation?” Find evidence that supports this difference. You might even keep this “evidence” on a note card where you will see it often. 5. Remind yourself that “that was then and this is now.” You are not the person you were when you had those previous experiences and although you may feel there are some similarities with your current partner, remind yourself that you can make different choices. You can make those choices not from fear, but from what you want more of. You can choose to focus on what you want and not on what you don’t want–and look for evidence that it’s there. That’s not to say that you close your eyes to harmful patterns that are actually repeating in your life. But it is to say that you look at what’s happening in your present with honesty and curiosity and not stay stuck in past emotions. Don’t allow your past to create your present and future. Do you have any advice for the same concerns but with the same person that put them there. Meaning Paul and Lisa date Paul cheats on Lisa often throughout a 5 yr relationship. Eventually they breakup Paul than marries Jane within a year of breaking up with Lisa. Four years later Paul is unhappy in marriage comes back to Lisa and cheats on Jane for months than leaves Jane seeking a divorce moves in with Lisa saying he is committed to her and wants to do things right this time around. Within a short timeframe there is a question about a personal card given to Paul from another woman. This is a concern to Lisa and she voices her concern which causes extreme problem with Paul. This issue turns into a raging hurtful argument that numerous red flags go up from the past cheating and other new areas of concern one of which is contradicting statements of his present feelings. What to do is in Lisa’s mind wanting so badly for Paul to be true. Is it possible to overcome these past fears and live a healthy life together? If so how? 1) Make sure Lisa is taking the time to heal from the past. This might mean working with a counselor or coach or sitting down to write in a journal weekly (or more often). The idea is to get those pent up fears and feelings about the past up and out. 2) As Lisa works to express emotions about the past and releases them, it will be easier for her to see the present clearly. If there are “red flags” showing up right now, that’s important to pay attention to and to trust her own self (what she’s seeing). Again, Lisa can take out paper and a pen and write down what she’s seeing now– contradictions, inconsistencies, etc.– and then when she talks with Paul about them, she’ll have firm information to go on. 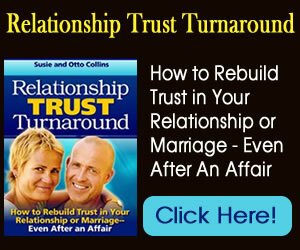 She can set healthy boundaries with him and she can ask him to create agreements with her that will help rebuild trust.